After completing a clean sweep over the West Indies in the T20s, Pakistan climbed to number 2 in the ICC T20I Rankings; which is the highest ranking they have achieved in the format. Its surprising though that Pakistan were not there, or even at number 1, earlier. They are clearly the most dominant international T20 team. 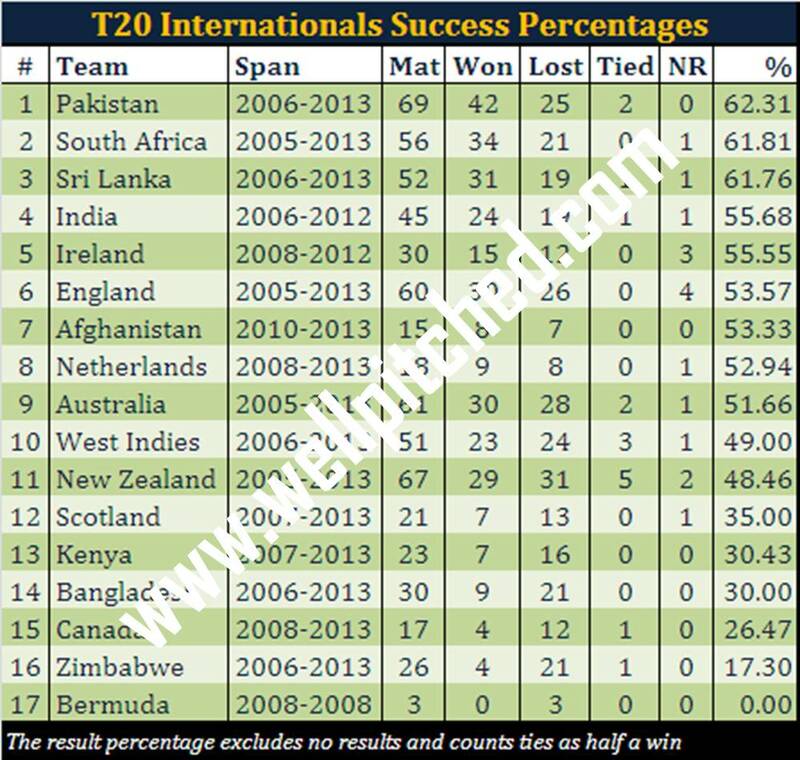 Even though Pakistan has played more T20Is than any other international team, they have also won more consistently than any other international team. 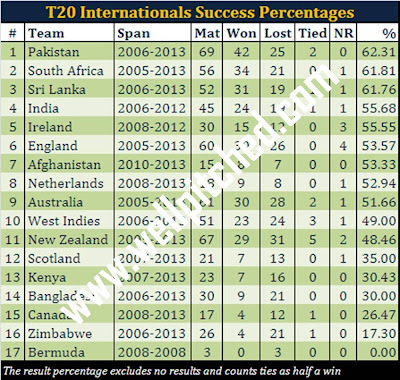 Pakistan's win percentage of 62.3% is the highest among the 17 teams that have played T20 Internationals. There are a number of other T20 records that belong to Pakistan and its players, which clearly spells out why Pakistan is the best T20 team in the world. If you have the bt phone and broadband connection in the UK, you can use it to browse through Pakistan's T20 records online and see how dominating a force they have been. Pakistan's series win over the West Indies was their 12th series T20I series win, which is the highest number of bilateral series won by an international T20 team. Pakistan boasts of not only the leading wicket takers in T20 Internationals, but the top 3 leading wicket takers - Umar Gul, Saeed Ajmal, and Shahid Afridi are on top of the charts with 74, 73, and 64 wickets respectively. I hate to say this but its true that Kamran Akmal, with 54 dismissals, has the highest number of dismissals by a wicketkeeper in T20 Internationals. Pakistan hold the record for taking the least number of deliveries to dismiss the opposition - they required only 74 deliveries to bowl out South Africa in Centurion in March this year. Saeed Ajmal's 25 wickets in 2012 is the second highest number of wicket taken in T20 Internationals in a calendar year. The record is Dirk Nannes' 27 in 2010. Pakistan's 103 run win over New Zealand in Christchurch in December 2010 is the largest margin of victory by runs for T20 Internationals not involving associates or affiliates. Umar Gul's six 4-wkt hauls in T20 Internationals is the most number of 4-wkt hauls in T20Is. Shahid Afridi has 8 man of the match awards in T20Is, which is the highest number of MOM awards in the format. He shares that record with Shane Watson. Right they say that the shorter the game, the better the Pakistan!